Karen Berry. The Starbucks on Thonotosassa Road was closed for nearly a month for renovations. For nearly a month the Starbucks located on Thonotosassa Road by I-4 has been closed for renovation. Early Wednesday morning it opened its doors once again. Karen Berry. The renovation mainly focused on restructuring the interior of the Starbucks. 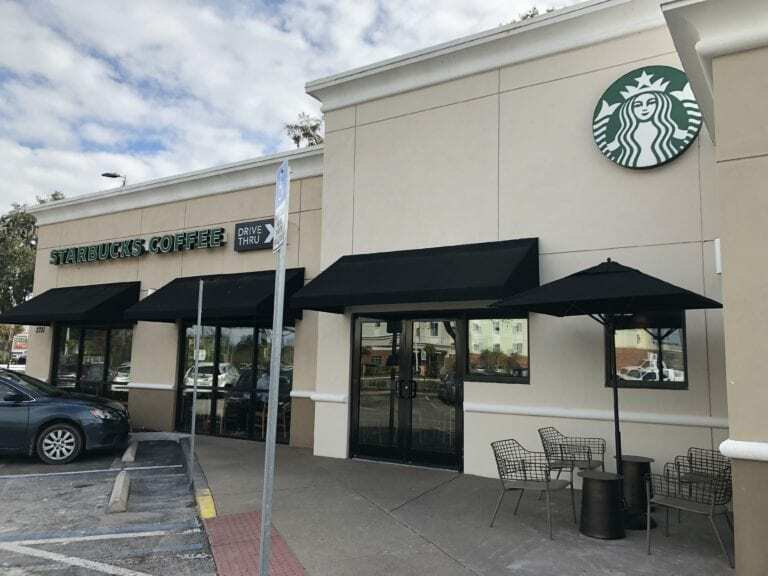 Java lovers have been jonesing for a fast cup of joe for nearly a month as the Starbucks on Thonotosassa Road near the interstate has been closed for renovations. The store at 2701 Thonotosassa Road was closed from Jan. 6. until Jan. 30. When it opened customers were greeted with an entirely new aesthetic. There is a minor extension to the building with new, though tighter, outdoor seating and inside it looks like an entirely redecorated store. Karen Berry. New seating, a new coffee bar and new general aesthetics have changed for the location. The wait times will probably not be any shorter as the drive through and walk-in lines remained the same, but the bar the staff works at is now expanded. The new seating places an emphasis on cozy gatherings with smaller high tops with stools with no backs and only a few long tables. A handful of traditional two-seater tables are by the windows. There are also a few seats at the far end of the barista bar. The bar itself is one of the highlights of the renovation. The wood-paneled bar stretches from the bakery case to the far end of the store. A fresh coat of grey paint adorns the walls and keeping with the minimalistic spirit there is a shiny nitro cold brew and traditional cold brew tap on display. Karen Berry. A nitro cold brew and traditional cold brew tap is on display at the coffee counter. For those who run in early to pick up a dark or pike roast cup of coffee before work they should note the amenities bar with the cream, sugar, honey and stirring sticks has been moved to the other side of the main door rather than by the sitting area.